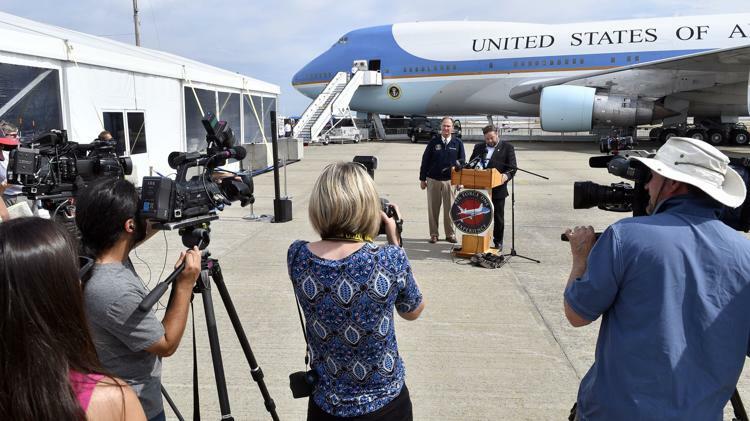 Ari Scharf, right, board chairman of the Children’s Democracy Project, and former Air Force One flight attendant Howie Franklin address members of the media during a preview tour of the Air Force One replica at Quonset State Airport Sept. 14. NORTH KINGSTOWN — American history enthusiasts will have the opportunity to see a full-size replica of the “Flying White House” and learn about the nation’s most prominent airplane for a limited time at Quonset State Airport in North Kingstown. Representatives from the New York-based Children’s Democracy Project, an organization focused on creating platforms to help children see and learn about democracy, unveiled the Air Force One Experience to members of the media Sept. 14. It opened to the public Friday. The exhibit showcases multiple U.S. presidential artifacts and allows attendees to both see and touch a Boeing 747 modeled after the executive aircraft, offering a glimpse into how a U.S. president travels the globe while in office. Ari Sharf, board chairman for the Children’s Democracy Project Board, said the organization knew the Air Force One exhibit would generate interest among not only children, but the general public. The focus, he said, has been on providing a comprehensive experience for visitors. Scharf said the idea to bring the world’s first replica of Air Force One to reality began 10 years ago. The Children’s Democracy Project reached out to different corporations seeking support and hopes “down the road” to have “as much corporate participation” as possible to get this historical message out to children. It took approximately two years and 150 team members to paint a former cargo aircraft at Quonset State Airport to match Air Force One, and to bring in all the pieces and furniture inside the plane. Several of the plane’s components were put together in Georgia, California, New York and Virginia before being brought to Quonset and installed. Visitors will first see a pictorial depiction of past U.S. presidents aboard Air Force One and other artifacts, including President John F. Kennedy’s 1960s era limousine; an original Air Force One seat Kennedy used on trips to Quonset during his presidency; a circa 1791 newspaper announcing George Washington’s arrival; and a handwritten letter from President Abraham Lincoln to a 19-year-old soldier explaining the importance of voting for the future of democracy. Howie Franklin, a retired U.S. Air Force sergeant and former chief flight attendant aboard Air Force One, served on the aircraft under the administrations of Gerald Ford, Jimmy Carter, Ronald Reagan, George H.W. Bush and Bill Clinton. He is one of the former flight attendants who assisted the Children’s Democracy Project in creating the exhibit, and offered a quick tour of the aircraft’s interior during the media session. Among the 747’s exhibits are a model of a conference room in which the president holds meetings while in flight; the president’s State Room, also known as Air Force One’s “Oval Office”; and the presidential quarters in front of the aircraft where the president and his family may relax while traveling. The Air Force One Experience preview will be at Quonset until Oct. 31, Scharf said, before the exhibition heads to an undisclosed location in New York as part of a nationwide tour. The Quonset location, open six days a week from 10 a.m.-6 p.m., will be the lone New England tour stop, according to a press release. Scharf said Washington, D.C., will be the Air Force One Experience’s permanent home. The Children’s Democracy Project has released 9,000 free tickets, 3,000 for each of the lower New England states – Rhode Island, Massachusetts and Connecticut – for the limited event. They must be reserved in advance by visiting airforceoneexperience.com. The cost to visit the exhibit in Quonset is $17.50 for adults and $10 for children. Attendees must have tickets in hand and pass through security checkpoints before entering the exhibit, the release states. No more than 50 people will be allowed on the aircraft at any one time. Attendees will not be allowed to take video or photos inside the aircraft due to security concerns, but photos will be available for purchase. For more information, visit childrensdemocracy.org and myairforceone.com.